We have a whole season of garden actions and workshops coming this summer! 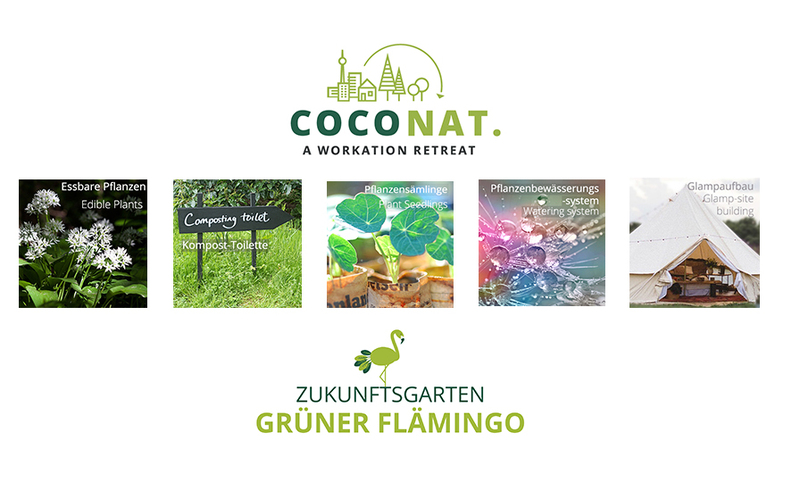 This weekend is just the exciting beginning of working together with the Zukunftsgarten Grüner Flämingo! We have a weekend of learning, growing and sharing planned. WILD EDIBLE PLANTS – we are starting to catalogue everything we find on-site and around – guided walks lead by our garden team! COMPOST TOILET – ever built one? Wonder how it works? Come on by, we are starting to build one this weekend! SEEDLINGS – We have a lot to get in the ground this weekend – you reap what you sow – Help us PLANT – Help us EAT at harvest time! WATERING SYSTEM – We’re creating a more sustainable and efficient watering system for the garden. Want to learn more about how this can work? Then you know…come by! Free GLAMPING* you say? If you build it you can come….FREE! We will put up our new Urbanara Glamp-site this weekend! Please send an e-mail to julianne@coconat-space.com if you plan to come! Für alle 8 Stunden, die Du uns im Garten hilfst, bekommst du einen Coconat-Gutschein! Inklusive einer Übernachtung in einem GLAMPINGZELT, Coworking Space und Nutzung der Gemeinschaftsküche. KOSTENLOS Coworking – Alle Helfer können natürlich unsere Coworking Spaces nutzen! Essen €10/Tag Umkostenbeitrag – Unsere Köche bereiten 3 vegetarische Mahlzeiten pro Tag zu. Wir berücksichtigen natürlich Veganer. Für speziellere Diäten können wir Lebensmittel bereitstellen und würden je nach Aufwand um eine Spende bitten. For every 8 hours you help us out in the garden, you will receive a Coconat voucher! –includes one night in a GLAMPING TENT!, coworking space, and using the shared kitchen. Coworking FREE – All helpers can also use our coworking spaces while they are here! Food €10/day – We will prepare 3 vegetarian meals a day. We can accommodate vegans as well. For other dietary restrictions we can make food, but may ask for a donation depending on the request. *What’s Glamping you say? Well, it is a Glamorous Camping of course! Thanks to our friends at Urbanara it will indeed be a Glamorous experience! We are very happy to work with Urbanara, as they work directly with makers across the globe, and are fully transparent about the entire making process, and work in a sustainable way.